Is it a strobe? Is it a flashgun? No, it's the Falcon Eyes Strobe Gun SG-100. Packing 100Ws of flash energy into an accessory-taking, speedlight-sized body at an estimated price under €200, this is no April Fools' joke. Hong Kong-based manufacturer Falcon Eyes have unveiled the Strobe Gun SG-100, a flash unit designed to bridge the gap between studio lighting and speedlights. Bearing some resemblance to a Quantum Qflash, the Strobe Gun is a speedlight-sized 100J flash unit powered by an external battery pack. The power supply can be loaded with Li-ion batteries or AAs in a manner similar to a camera body grip. 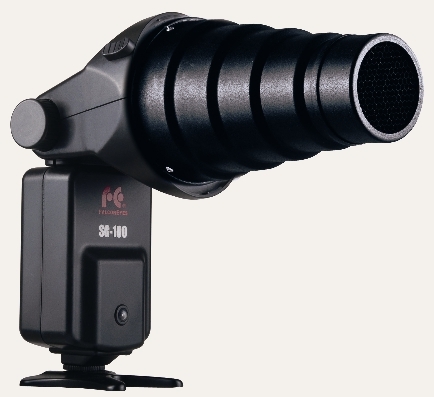 The Strobe Gun SG-100 inherits the characteristics of both a studio strobe and camera flashgun. It is far more powerful than a flashgun, yet greater in mobility as it can be mounted on the camera hotshoe and is DC powered. 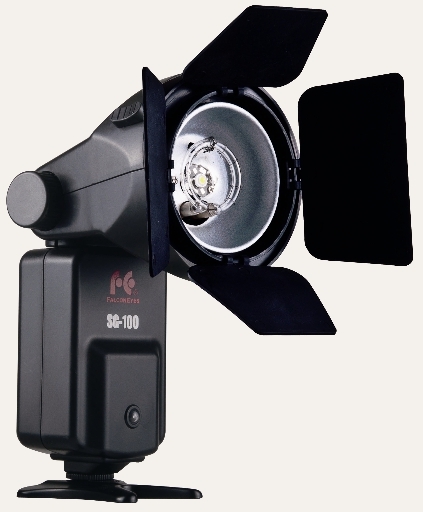 The SG-100 has a built-in adaptor for our Flash Gun Accessories Series (SGA). No extra adaptor required. 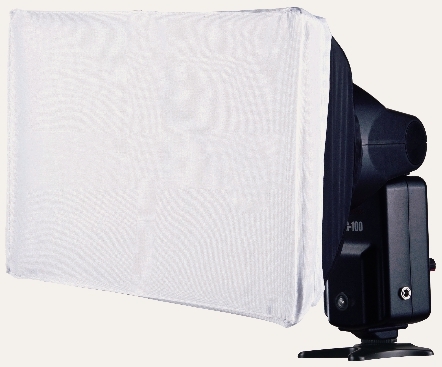 With the mini diffuser ball, soft reflector, honeycomb, etc. you are now ready to take your mini studio outdoors. With AA/Li-ion batteries, photographers can take photos all day long! There is no boundary to creation, imagination and execution! There is no definitive release date, exact price or list of distributors for the Strobe Gun at the moment. For more information, please visit the Falcon Eyes web site, where you will find full specifications and more images in the company’s 2010/2011 product catalogue.